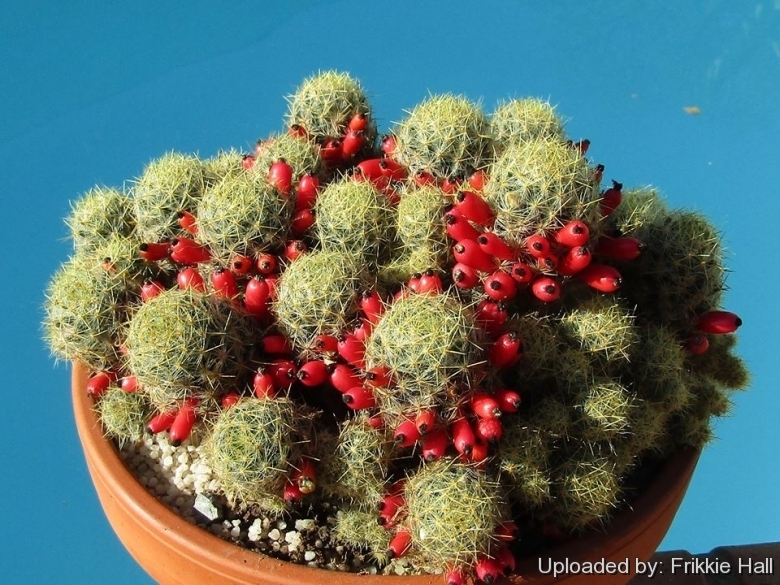 Mammillaria prolifera with its bright red seedpods. Origin and Habitat: The species occurs very widely from Mexico (Coahuila, Nuevo León, Querétaro, San Luis Potosí and Tamaulipas), the USA (Texas), Cuba, the Dominican Republic, and Haiti. The typical subspecies prolifera occurs throughout much of the Caribbean. Altitude range: It is found at elevations of 400 to 2,250 metres above sea level. Habitat and Ecology: The species grows in submontane scrub. In Texas, it occurs in grasslands at low elevations and in Cuba, the plant grows in low, dry thicket. Mammillaria prolifera is quite inconspicuous but has a very large extent of occurrence and is abundant. Although there are threats in places (habitat destruction through logging), they are not sufficient to warrant any concern. 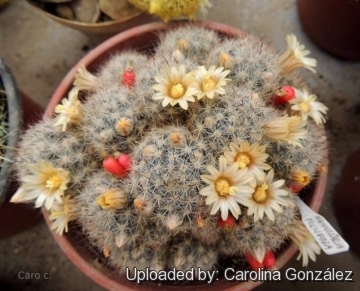 Description: Mammillaria prolifera is a low growing cactus, commonly branching to form colonies often 6 dm in diameter. Four subspecies are recognized, the nominate subspecies, subspecies arachnoidea (D.R.Hunt) D.R.Hunt, subspecies haitiensis and subspecies multiceps (Salm-Dyck) U.Guzmán (including subsp. texana (Engelm.) D.R.Hunt.). Stems: The individual stems dark green, globose, cylindric or club shaped to 9 cm high, 3 to 7 cm in diameter (6-7 cm in diameter in subsp. prolifera), of soft texture. Tubercles: Cylindrical to conic, about 8 mm long, spreading, without latex, Axils of tubercles with several long, hair-like bristles. Radial spines: 25-40, hair-like, often intergrading with the centrals, straight or twisted, white to yellow to brown, 3-12 mm long. Central spines: 5 to 12, needle-like, puberulent, 4-9 mm long, much stouter than the radials, straight, white to yellow to reddish, with darker tips (Typcally yellow in subsp. prolifera). 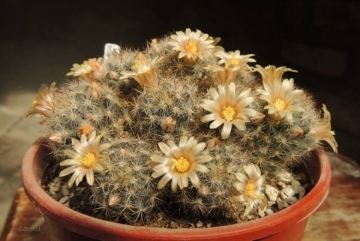 Flowers: 10-18 mm long, borne in old axils but toward top of plant, small, yellowish white, cream or pinkish yellow. Inner perianth-segments erect, pale yellow, with brownish mid-rib, acute; filaments pale rose-coloured; anthers at first deflexed inward; style shorter than filaments; stigma-lobes 3, yellow. Seeds: Black, pitted, a little depressed; aril white, triangular. Mammillaria prolifera (Mill.) Haw. : (subsp. prolifera) has stems 6-7 cm in diameter, cream to pinkish yellow flowers and yellow spines. Distribution: throughout much of the Caribbean. Mammillaria prolifera subs. arachnoidea (D.R.Hunt) D.R.Hunt: has slender, fine central spines and quite narrow funnelform flowers. Distribution: Tamaulipas and Hidalgo. Mammillaria prolifera f. cristata hort. : Crested form. Mammillaria prolifera subs. haitiensis (K.Schum.) D.R.Hunt: has stems to 7 cm in diameter, cream-white-yellow flowers and more spines than the type species, giving it a more whitish appearance. Distribution: endemic of Hispaniola. Mammillaria prolifera subs. multiceps (Salm-Dyck) U.Guzmán: has white and brown spines. Distribution: USA (Texas) and northeastern Mexico (Coahuila, Tamaulipas, Nuevo Leon and San Luis Potosi). Mammillaria prolifera subs. texana (Engelm.) D.R.Hunt: has whitish or else translucent, honey-yellow spines and dirty yellow,pinkish or almost tan flowers(same as subsp. multiceps?). Distribution: Southern Texas along the Rio Grande river. 2) Goettsch, B.K., Gómez-Hinostrosa, C. & Terry, M. 2013. 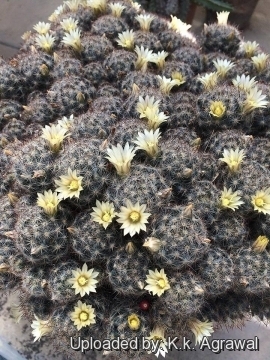 Mammillaria prolifera. The IUCN Red List of Threatened Species. Version 2014.3. <www.iucnredlist.org>. Downloaded on 01 April 2015. 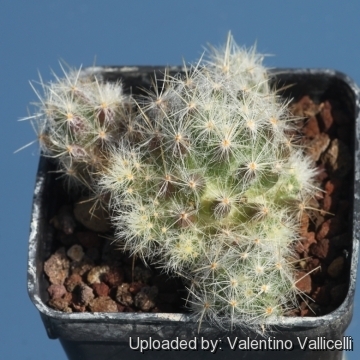 Cultivation and Propagation: Mammillaria prolifera is a freely clustering species that reproduces easily by cutting, recommended for any collection that needs lots of light with ample airflow. 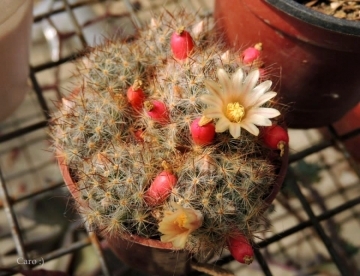 Given the kind of care used on any but the desert forms of cacti, even in a small pot, this little cactus will grow and proliferate its small heads into an interesting cluster.